SIMPLE ENCOUNTER can often change the course of one’s life, or perhaps the course of many lives. This is often true for both parties who meet each other for the first time—no matter how disparate the social or political standing. Pope Francis has made it clear he will embrace the most lowly in society: Pope Francis To Hold Holy Thursday Mass In Casal Del Marmo Youth Jail where he will wash prisoners’ feet. Certainly, Pope Francis will change lives forever through this profound encounter. Fr. 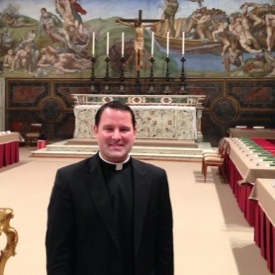 Jonathan Gaspar (Priest Secretary to His Eminence Seán Cardinal O’Malley) has been in Rome during the conclave through the installation of Pope Francis. Recently, Fr. Gaspar had the opportunity to meet privately with Pope Francis. With his permission I will share with you more of his heartfelt words upon his personal meeting with Pope Francis. In this encounter, there is an important message for all of us; it is a three-fold message of love, thanksgiving, and prayer. Even the Pope needs our love, our thanks, and most especially our prayers! “This morning Cardinal Seán asked me to deliver a note to the Pope’s secretary at the Domus Santa Marta, the guest residence in Vatican City where Pope Francis has been living since his election. While speaking to his secretary, the Holy Father came down the hall and I greeted him with the traditional kissing of his ring, and we spoke for a little over a minute. He was kind and seemed happy to speak with me! He told me how much he respected Cardinal O’Malley. “I told him three things: first, that we love him; second, I thanked him for his beautiful example of humility for me as a priest and for all Christians; lastly I told him that I was praying for him. When I told him that I was praying for him, he lit right up, thanked me for my prayers and asked me to continue praying. “I’m still amazed at his approachability and simplicity. I will never forget this encounter, and I wanted to share it with all of you so that you will appreciate how special Pope Francis really is. Great way to end my trip to Rome for these historic days in the life of the Church. I have read the above words several times, and I am still amazed at what I learn each time I read them.